Partly cloudy skies. High 83F. Winds SW at 10 to 15 mph.. Rain showers in the evening with scattered thunderstorms arriving overnight. Low 57F. Winds W at 5 to 10 mph. Chance of rain 60%. The bats came alive for the Logan High School softball team on Wednesday at Mingo Central as the Lady Cats pounded on the Miners in a 13-1 mercy-shortened win. Logan outhit the struggling Miners 13-3 and used a six-run third and a five-run fourth to break the game wide open. The game was stopped after four innings due to the mercy rule. Logan improved to 6-12 overall and 5-6 in the Cardinal Conference and swept the season series with Mingo Central, also taking a 13-5 win back on March 25 at home. Ashlyn Conley was 4-for-4 with a pair of doubles and five RBIs to lead the Logan attack. Sarah Noe was 2-for-3 with a triple and two RBIs, while Raegan Quick was 2-for-4 with three runs batted in. Chloe Bryant and Haley Maynard both doubled for Logan. Abby Baisden had a single and two RBIs. Emma Vinson and Emma Elkins both singled as well. Zoe Evans, Carrie McGuire and Kara Hunt had hits for Mingo. Bryant pitched a complete game win for Logan, going four innings and allowing one unearned run on three hits with four strikeouts and two walks. Kaleigh Baisden was the starting and losing pitcher for the Miners. She allowed 13 runs (just three earned) on 13 hits with two strikeouts and four walks. Mingo Central committed four errors in the game to none for LHS. Logan was slated to play at Sherman on Thursday. The Lady Cats host two-time defending Class AA state champion Herbert Hoover on Friday and head to Sissonville on Saturday. WYOMING EAST 8, LOGAN 0: Wyoming East made it sweep over the Logan High School softball team with Tuesday night's 8-0 victory over the Lady Cats at New Richmond. Wyoming East senior All-State pitcher and Ohio University recruit Holly Brehm fired a complete game six-inning one-hitter, striking out 17 Lady Cats and walking none. She recorded her 1,000th career strikeout in the victory. Emma Vinson pitched for Logan, going 5 2/3 innings and allowing eight earned runs on 13 hits with two strikeouts and no walks. Vinson had Logan's only hit, a single. Brehm and Paige Laxton hit home runs and drove in two runs apiece for the Warriors. Kelly Cameron, Trinity Cook, Kelsey Green, OIivia Hylton, Haliegh Parsons all doubled for East. WINFIELD 4, CHAPMANVILLE 3: Faith Gaylor was the hero for Winfield on Wednesday as the Generals squeaked out a 4-3 win over the Chapmanville Regional High School softball team in Cardinal Conference action at Winfield. Gaylor was the winning pitcher in relief of starter Elyssa Medley and clubbed a game-winning, walk-off RBI single in the bottom of the seventh with two outs, breaking a 3-3 deadlock. Kenzie Hale hit a solo homer for Winfield in the sixth. Freshman Sierra Cook took the loss within the circle for the Lady Tigers, going seven innings and allowing four runs on five hits with nine strikeouts and five walks. Shea Pridemore and Baylee Belcher each had two hits for Chapmanville. Ashleigh Mahon doubled and Katlin Moore and Sidnee Varney both singled. CRHS dropped to 9-7 overall and 6-5 in the conference. Winfield improved to 12-7, 7-3. The Lady Tigers are scheduled to play at Wayne on Friday at 5:30 p.m., weather permitting. Chapmanville goes to Sissonville on Saturday and hosts Man on Monday. CHAPMANVILLE 9, SCOTT 1: Chapmanville Regional gained a season series sweep of Scott with Tuesday night's 9-1 victory over the Lady Hawks in Madison. Chapmanville had beaten Scott earlier in the season at home, 4-0. Tabitha Adkins pitched the win for CRHS, going seven innings and yielding one run on three hits with six strikeouts and three walks. Adkins also hit a home run and was 2-for-4 at the plate. Katlin Moore was 3-for-5 for Chapmanville and Baylee Belcher was 2-for-4 with a double and a run knocked in. Shea Pridemore, Jenna Barker, Ashleigh Mahon, Sidnee Varney and Tonya McCormick all singled. Barker also had an RBI. 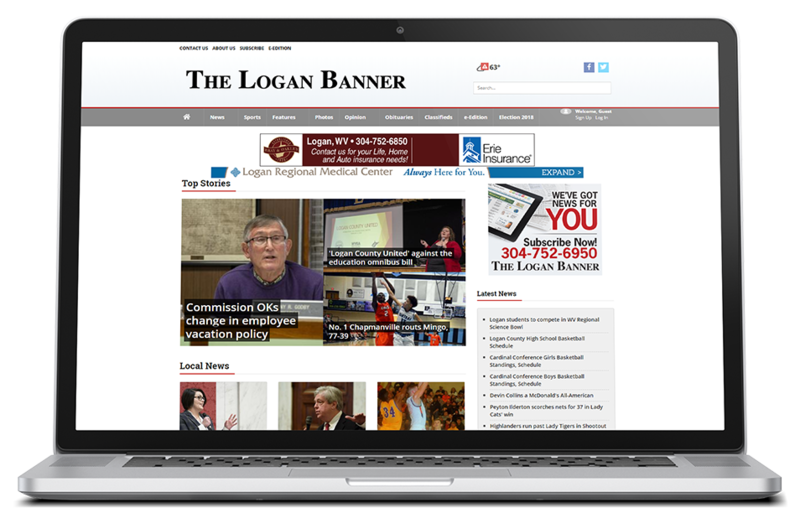 Paul Adkins is the Sports Editor of the Logan Banner. Follow him on Twitter @PAdkinsBanner or email him at padkins@hdmediallc.com.